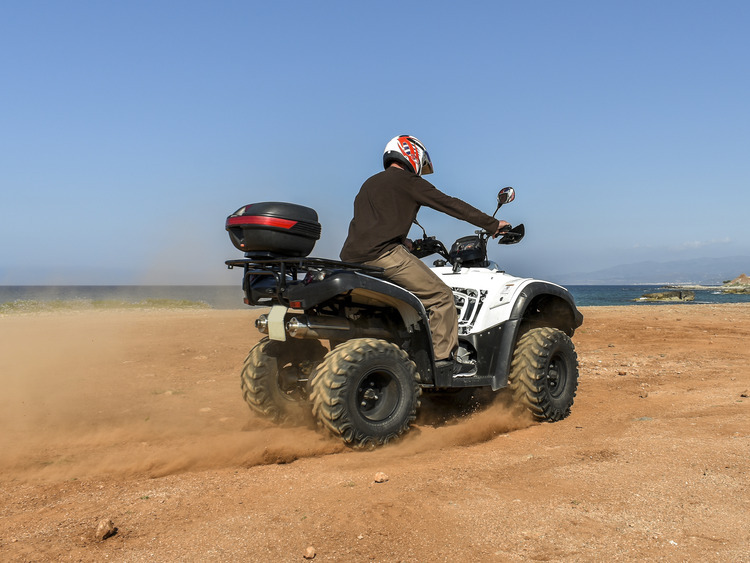 Let us explore the area around Progreso on a thrilling quad excursion along dirt roads offering amazing views and relaxation on the beach in the warm Mexican sun. We leave the port on a fully air-conditioned coach or minibus and reach our meeting point in only 30 minutes. Our bilingual guide assigns us a quad each, gives us the necessary driving instructions and hands out the safety equipment. We are ready for our adventure on our powerful vehicle. It doesn’t matter whether you are an expert or a beginner as this offroad excursion ha something for everyone: we drive in a convoy following our guide along a scenic sand route overlooking the Gulf of Mexico**. We pass through the sleepy village of Chelem and for an hour we feel like true masters of the road with the wind in our hair and our eyes filled with beauty. Along the way, we stop for some photos to capture the beautiful nature with our cameras. After the quad ride, a relaxing beach break awaits us in a beach club where we can lie lazily on our lounger, cool down in the water and enjoy the Mexican sun before heading back to the port. Pregnant women and guests with cardiac, breathing, back and neck problems are not allowed to take part in this excursion. A bottle of water or soda is included.